The very first shot in John Ford’s The Man Who Shot Liberty Valance is of a train pulling into a little railway station. Anyone familiar with the grammar of classic movie westerns will know that the railroad plays a very special role in these films: it’s a symbol of advancement, the bridge between the Old West and the New West; in some ways a bridge between savagery and civilisation. American mythology has it that before trains connected the Midwestern towns and frontiers with the East Coast, the rule of the gun prevailed. Authority figures were often irrelevant; the winner was usually the fastest draw. On the train are the US senator Ransom Stoddard (James Stewart) and his wife Hallie (Vera Miles), who have come to visit the small town of Shinbone where they had first met a long time ago. They are received at the station by an aging former Marshall, and one immediately senses the nostalgia in the air. “The place sure has changed, Link,” Hallie tells him, “Churches, high schools, shops…who would have thought it?” “The railroad’s done that, Hallie,” he replies. The tone of this conversation is telling. They are talking about the markers of civilisation, of human progress, yet there’s a residual sadness, a sigh of regret beneath the words. There’s something almost grudging about the acknowledgement that change has, on the whole, been for the better. Stoddard and Hallie have come to Shinbone for the burial of an old friend named Tom Doniphon, a man hardly anyone in town even knows about. The editor of the local newspaper, thrilled at the chance to interview a possible future vice-president, presses Stoddard for details. Who was this Doniphon and why was he important enough for a US senator to take time off from his important schedule? 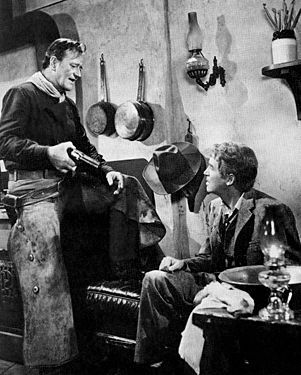 John Wayne and James Stewart were 54 and 53 respectively when this film was made, and one of the standing criticisms of The Man Who Shot Liberty Valance is that they were far too old for their characters in the “flashback sequence” (which is, after all, 90 per cent of the film). Makeup helps to an extent, and one of the most notable things about Stewart’s performance as the young Ransom is how he quickens his reactions and physical movements without making it very obvious. He’s a lot more alert and sprightly than he presumably was in real life (in fact, even as a young man, Stewart’s stock in trade was a shuffling, slow walk and a Midwestern drawl – so this performance, given in his 50s, is probably among his most energetic ever!). The criticism about age is of course justified from the point of view of verisimilitude, but it’s impossible to imagine this film without these men in the leading roles, for their screen personalities are crucial to its effect. Stewart, a more nuanced actor, was the modern man – vulnerable, complex, unafraid to show a feminine side (in fact, he spends some of the key scenes in this film in an apron, which has led to much critical analysis of gender roles!). This was reflected in the roles he played in middle age, especially in films by Hitchcock and Anthony Mann. Wayne, in contrast, was repeatedly used by Ford in their many films together as an emblem of the Old West – the macho cowboy who survived by his shooting skills. By all accounts, the screen image was not very far from the man’s real-life persona, for Wayne was known to be jingoistic, brow-beating, politically on the far right, pro-Vietnam War, full of notions about what “real men” must be like. I tried to explain. “Hey John, I’m an actor. I like to play interesting roles. It’s all make-believe. It isn’t real. You’re not really John Wayne, you know.” He looked at me oddly. I had betrayed him. I took it as a compliment; the picture had moved him, or at least disturbed him. This is one side of the story. For the other side, you need to watch Wayne in some of his best roles in films like The Searchers, She Wore a Yellow Ribbon and Red River – movies where he betrays a vulnerability, even a lack of self-confidence, beneath the posturing. Though a limited actor in many ways, he had the ability to convey the sadness and disaffection of a man who knows deep inside that his beliefs and values have no place in a rapidly changing world. Some of this can be seen in The Man Who Shot Liberty Valance: note the many scenes where Wayne watches Stewart with a curious little smile on his face, trying to figure him out. Or the way he observes the growing closeness between Ransom and Hallie and realises that he is losing “his girl” (another phrase that has its roots in an old patriarchal system) to a more sensitive man, a symbol of progress. Above all, note Ford’s seeming iconizing of Wayne in scenes like the key conversation between him and Stewart near the end of the film (the slow dissolve where, for a couple of seconds, what we see on screen is the sort of image that would be perfect for a postage stamp). But what Ford is doing here is more complex: he’s inverting the myth. This isn’t a Wayne character who will ride off triumphantly into the sunset; he’ll fade away quietly, spend his later days forgotten and alone. Like many of the best Hollywood classics, The Man Who Shot Liberty Valance can be appreciated foremost on narrative terms. The story, the dialogue and the performances (including Andy Devine as the cowardly Marshal Link Appleyard, and of course Lee Marvin as the petulant outlaw whipping his victims with a belt – a Method performance that's delightfully incongruous to this film) are of the highest order, and held together by one of the greatest of movie directors. John Ford made so many superb films that one tends to take his oeuvre for granted – rarely is there a singling out of this or that movie, the way one often sees done with Welles or Kurosawa or Hitchcock or Bergman. But this latter-day film is undeniably among his very best work. 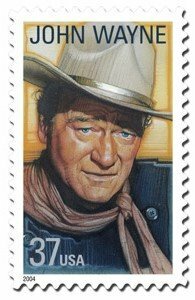 As you point out it indeed makes a very evocative point about the passing of the old era, it is this that gives john wayne's performance a poignant edge. also i saw anatomy of a murder a few days back. stewart was unusually animated and energetic in that movie too. 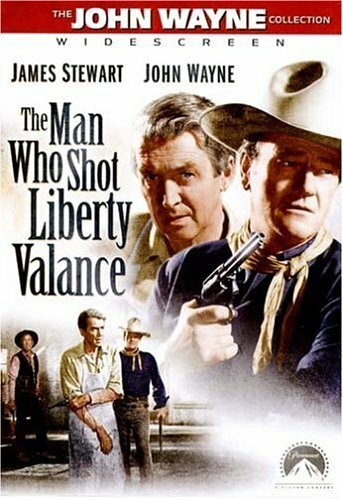 although i think it came a few years before liberty valance. 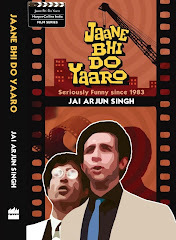 I had watched this movie many times and I was kind of waiting for your post on this movie. LIberty Valance is one of my most favourite films! Oddly enough, I was thinking of it just the other day, in the context of television. One of the primary oppositions in the film, as you've pointed out, is between the law-less and the law; it's odd how that dichotomy has been carried over into American serials with amazing regularity. So many serials are either about cops or about lawyers. They are the two defining careers of the last 100 years, at least as they appear on screen. now I am keen to watch the movie. I like this review very much. Its nice how you write tid-bit trivia about the movie and the actors and join them seamlessly with the overall movie review and that too without losing the big picture about the movie. Its informative, its intersting and its insightful too. I havent seen hollywood classics but after reading this, I will definitely try to try some. Thanks for the post, great work. What was it Orson Welles said when asked who his three favourite American directors were? "John Ford, John Ford, John Ford." Alok: You'd be hard pressed to find a John Wayne western that didn't have an old drunk in it! Liberty Valance had the memorable newspaper proprietor Dutton Peabody, played by Edmond O'Brien. Jonathan: I've heard about that Welles quote in slightly different forms. In one version, he said he learnt everything there was to know about film from "the old masters", and when asked which old masters specifically, he replied "John Ford, John Ford and John Ford". Also, he once famously said that Stagecoach was his film textbook - he watched it 40 times or so. Space Bar: there should be some interesting sociological insights into the evolution of the modern American character - from cowboys vs Indians to good cowboys vs bad cowboys to cops 'n robbers! I am an avid fan of the Duke as well as James Stewart. I have often wondered where the Picket Wire refered to in this movie actually is. Halie said that "when it's damed there will be plenty of water". All I can find is a canyon area in southeast Colorado. Anyone have any ideas. I think it is also refered to in Chisum. Anyone have any ideas? This is a great movie. On the topic of old drunkards, watch True Grit. John Wayne plays the old drunkard in that movie. Being a an ex-hippie/pacifist/far left voting type of guy….. I have never been a fan of westerns or Wayne, but this movie, along with “The Searchers”, continuously beats me over the head. What buggs me most is that Edmond O'Brien was not even nominated for Oscar. He surely would have won it. I pity anyone who don't like westerns because they are "formulaic." Genres are supposed to be formulaic or they cease to be a genre. @Jabberwock: Love your piece, especially the Kirk Douglas anecdote. John Ford gives audiences lots to think about in this film.